It’s a wine rack! The Attrezzi Wall Mount Wine Rack, in fact. Place this space saving, wall mounted wine rack in your dining room or kitchen for an artistic conversation piece that gives any decor unique interest. It has abstract “gear” styling and is constructed of Asian hardwoods with a hand-painted distressed rust finish. No assembly required. 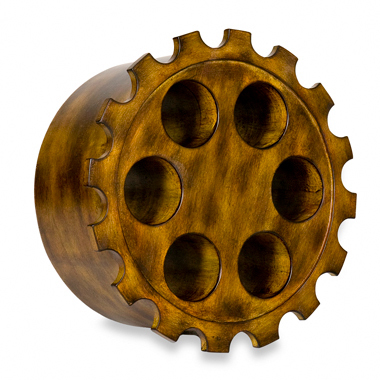 Measures 7 1/2″ D x 5 3/4″ in diameter and holds six wine bottles.